Every homeowner knows that a leak is a bad sign when it comes to your roof. After all, if you have water pouring into your home, your roof simply isn’t doing its job. But how much damage is a leak really causing? Behind our walls and above our ceilings, leaks can be causing serious damage, especially if they’re aloud to sit through storm after storm. That’s why it’s so crucial to have your roof inspected and repaired right away if you’ve noticed a leak (and that’s why we recommend roof inspections every year or two, even if you haven’t noticed a leak). We’ve cataloged a few of the unseen dangers of a leaky roof, so that you can be aware of the damage that could spring up. Ideally, your attic and wall cavities are devoid of moisture. However, with a roof leak, you can end up with water trickling down your walls and pooling in your attic. When that happens, you’ve created the ideal environment for mold and mildew growth. Think about it: These spaces are warm and humid, which will prove to be the perfect habitat for mold and mildew. Now, mold and mildew aren’t just gross, they can be dangerous and damaging. For example, if you have black mold growing in your home, you and other residents may be unknowingly be breathing in the stuff, which can lead to a variety of health problems. Beyond that, mold and mildew will slowly attack the wood structure of your home (among other components) which could eventually cause that structure to fail. A leak can damage the insulation that you have throughout your home. If your insulation gets wet, it will be far less efficient, and it is difficult to dry out that insulation. In addition, a leak can cause insulation to be displaced in your attic, ceilings, and walls. If water is pouring down in these areas, it can force your insulation to sag or detach from any surface it was attached to, which means that you’ll be left with an exposed gap that has no insulation coverage — that can cause an easy loss of warm air in the winter time and air conditioned air in the summer. If you’ve noticed that your energy bills are on the rise, it may actually be due to a roof leak. Have your home inspected if you’re unsure. As we mentioned, mold and mildew can damage the wood structure of your home. In addition, if water is running along wood components of your home, they will warp and bend over time. That can damage the structural integrity of your home, and it can end up causing visible damage to your walls and ceilings. 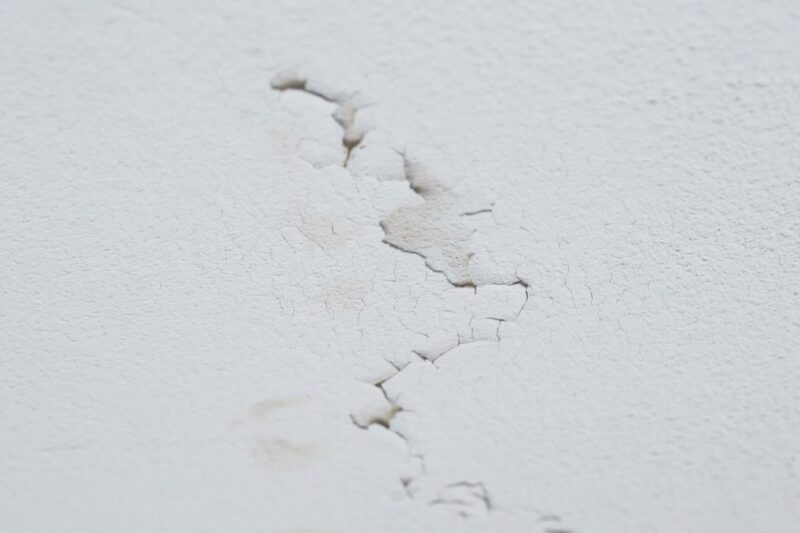 If you’ve noticed that the drywall is cracking throughout your home, it may be caused by structural shifts that have occurred due to a leaky roof. Water and electricity don’t mix. If you have a leak that is leaving water against outlets, wires, or even the breaker box of your home, then you could be setting your home up for a disaster. A leak can create an electrical arc, which can cause a house fire. Beyond that major hazard, leaks can also damage your wiring, rust your outlets, or cause your breakers to trip. These issues can prove to be expensive, since you may have to tear into your walls to perform any repairs. A stitch in time saves nine: That old adage proves true with leaky roofs. If you have a roof leak, then the leak will only get worse over time. Since the leak can damage the support structure of your roof and the plywood of your roof, a leak can grow bigger, which will cause this problem to spiral out of control. Again, that’s why it’s crucial to act right away when you notice a leak — the problem will only worsen, and the repairs will only become more and more costly. Whether you’ve noticed a leaky roof, or you’ve decided to have your roof inspected to ensure that a leak doesn’t go unnoticed, we’re here to help. We can provide you with roof inspection or repair services, so that you can trust the roof over your head once again. Red Dog’s Roofing proudly provides roofing services for folks throughout Fitchburg, Leominster, Gardner, and the surrounding area — give us a call today to schedule an appointment.